Once you have decided upon the product categories, the filters and the variants to use, you can start adding your products to the catalog. You will do this through the "Add Product" page which you can access by clicking "Catalog > Add Product" in the Administration Panel. Figure: Add a product by choosing "Catalog > Add Product" in the Administration Panel. You can use this page to add a new product to the catalog. The "Add Product" page is split into 4 different sections: Presentation, Pricing, Promotion and eProducts. We will go through each one of them explaining the process in detail.
! The exact same sections and fields can be edited for an existing product by choosing "Catalog > Products" and clicking on the product's name. The first step of the product addition process is to define the general presentation of the product. This would be the product's name, code and description as well as the categories, filters, images and attached files assigned to it. We will go through all different fields in the presentation page, to see how this information can be added to your storefront. At the top of the product presentation page you are given the option to define a Product code. This is a unique identifying code that will help you manage your products in a simple and efficient way. The Product code can consist of any number of characters. These can be numbers, letters, spaces, special characters etc. You can also define an SKU for your product (Stock Keeping Unit: A common term for a unique numeric identifier, used most commonly in online business to refer to a specific product in a catalog). Both the Product code and SKU are optional. Magnet Commerce also allows you to make the current product unavailable to your customers simply by ticking the 'Hide product' box. You might for example want to hide the product because it is temporarily out of stock. Should you wish to make the product available again, simply untick the "Hide product" check box. Figure: Editing a product's code and/or SKU - Defining product availability.
) and Description which is shown at the products presentation full page. Alternatively, right clicking in the text editor box gives a menu with numerous options for inserting, text editing and formatting. For example, using the insert tab, you could insert images, videos, pdf documents etc. With Magnet Commerce you can provide product name and descriptions in as many languages as you like! Once you have chosen the appropriate language by clicking on the language tab you can start adding the product name and descriptions in that language. Figure: Editing a product's name and descriptions. You will also need to select one or more categories under which your product will be classified. You will do this by highlighting a category from the 'Available Categories' list and pressing the 'Add' button. The categories selected for the product are listed in the 'Selected Categories' field. If you wish to delete any of them simply highlight it and press the 'Remove' button.
! Please remember that the category selection is obligatory. If you don't list your product in one of your e-store's categories, the product will not appear on your storefront! Figure: Selecting the categories and subcategories under which the product will be classified. It is also useful to add filters to your product. These will help your visitors locate what they are looking for quickly and effectively by filtering the products in your catalog. To add a filter select the filter group from the drop down menu and then choose the appropriate filter value from the types available. Finally click the 'Add' button to add the filter to your product. If you wish to delete any of the filters you have chosen, simply press the 'Remove' button for that filter. 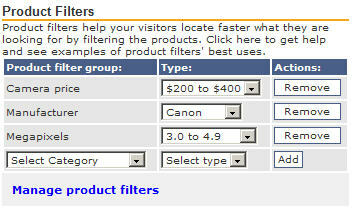 Figure: Adding filters to the product to help customers find the product faster. Through this page you can also upload photos for your product. You dont need to use any other software to do this neither do you need to worry about resizing the photos; they will be re-sized automatically when uploaded. You can upload as many photos as you wish for each product: The first image is displayed as a thumbnail at pages with product lists and as the main picture in the product's full presentation page. All other images are only displayed at the product's full presentation page as thumbnails. All these thumbnails when clicked open a popup window with the original uploaded picture. The default size of all thumbnails is now set to 80x80 pixels. However you could change this setting from "Setup > General" options.
! You don't want to load images larger than 500 pixels since this will slow down the process of viewing the original images! In order to upload an image use the browse button to select the image file (alternatively you can explicitly type the pathname of the image in the text box), and click the 'Add New' button. You can use the arrows in the "Order" field to change the order of the images (remember that the first image will be displayed as thumbnail at pages containing product lists). Should you wish to remove a file, simply press the "Remove" button in the "Actions" field. You also have the option of defining a redirect link. Define a redirect link by simply typing it in the "Redirect link" text box. 1. Not use the redirect link. 2. Redirect your customers to this link when they click on the product name found in any of the product list pages (category lists or search results). You could for example use this is for building a shopping catalog. In such a case you probably want your visitor to be redirected to the product seller's page once the product has been selected. 3. 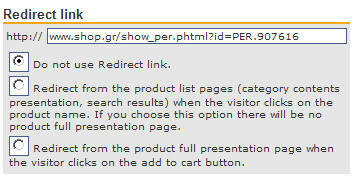 Redirect your customers to this link when they click on the "Add to Cart" button in the product's presentation page. Apply this when you want your customers to complete the purchase from a different webpage. Figure: Defining a redirect link. Finally, you can attach files to your product, such as a technical specifications word document. Your visitors will be able to download these documents from the full presentation page of your product. To attach a file use the browse button to select the file (alternatively you can explicitly type the file's pathname in the text box), and click the 'Add New' button. You can use the arrows in the "Order" field to change the order the files will be appearing in. Should you wish to remove an image, simply press the "Remove" button in the "Actions" field. Figure: Attaching files to your product. Once all the information has been added to the product editing page, add your changes to your e-store's front end by clicking on the "Update product presentation" button. Figure: Updating the product presentation page on your storefront. Once the product presentation has been updated, you can check that all your changes are present to your storefront's product page by clicking on the "View Shop" link, situated on the top right of the Administration Panel page. 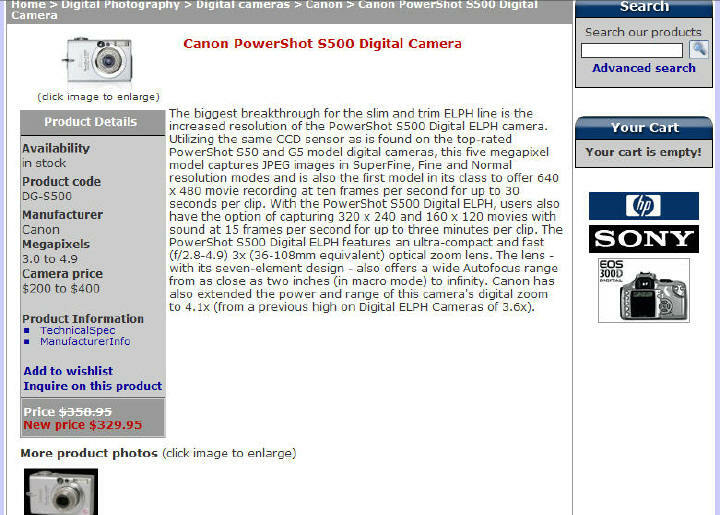 Figure: Page of the Canon PowerShot S500 Digital Camera on the e-store's front end after submitting the previous product presentation settings. The second step when adding a product is to define the product's pricing. Using the pricing page you can specify the base price for your product, add extra charges for specific variants (e.g. different colors, sizes, guarantee options etc.) or set a discount on your initial price. You can also define the product's weight, whether the product is for sale, whether it is taxable and define how many items of this product are in stock. Lets have a look at all these settings in more detail. Figure: Editing the product's pricing settings. Base price: When adding a product you will have to define a base price for it. Enter the product's price in the "Base price" text box (using the dot "." as the separator for decimal numbers). Note: If the product's base price is 0, the option "Add to cart" is not available for this product! Non-taxable product: If you don't want to apply tax on this product tick the "non-taxable-product" box. Weight: You can also set the product's weight by typing it in the "Weight" text box. This will be used for calculating the shipping costs. Product is for sale: To define that the product is for sale, tick in the "Product is for sale" box. Note: If a product is not for sale, the option "Add to cart" is not available for this product! Stock: Define the number of items in stock. This field is used for setting the stock only if you don't use variants that affect the product stock for this product (see following section). If you do use variants which affect the product stock, this field has no effect, and you will need to use the stock tab for setting the product stock. When you first insert a product, its stock is set to 9999 (unlimited). Change this number to a positive digit if your product is in stock, or 0 if out of stock. You can also use a negative digit, which is important if backorders are allowed. Variants: Here you can set the variants (color, sizes etc.) that your product is available in. Simply select the variant group from the "Group" drop down menu and then a specific variant from the descriptions available. You can also choose "All" from the description drop down menu to insert all variants in one go. Remember that different variants of a product can vary in price. 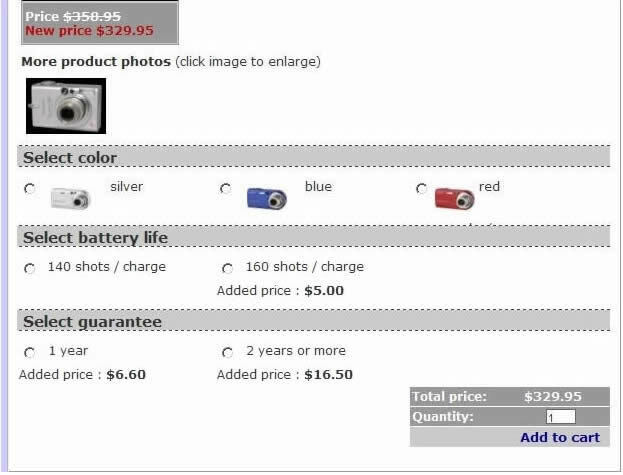 For example a camera that comes with a '2 or more years' guarantee will be more expensive than the '1 year' option, so you can set the additional cost by typing it in the "Extra charge" box. You have two options for setting the additional price, a percentage of the base cost, or a simpler fixed price. Just choose the appropriate format from the "Extra charge is" drop down menu. It is also useful to display the different variants by adding thumbnails so people can clearly see any differences. Your customers are more likely to purchase if they can see the product they are buying and differences with other similar items. 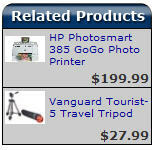 Once you have set a product variant, any surcharges and images click the "Add New" button. There is no limit to the number of variants you can add to a product. But you don't want to add too many as this could make ordering complicated! You can change the order in which the variants will appear on your storefront by using the buttons under the "Order" list. Click on the "Remove" button under the "Actions" list to remove any variants you don't want to keep. Finally, you can easily add new variant categories by clicking on the "manage product variants" link. For more information on product variants, please have a look at the Product Variants chapter.
! Variant groups can affect or not affect the product stock (e.g. 'Size' might affect stock but 'Guarantee options' wouldn't). If you introduce or delete variants that affect stock, the current stock status of your product will change. This happens because the stock status differs for every variant combination and some (or all) variant combinations will be reproduced. The stock of the new combinations will be set to either 9999 (when you introduce) or 0 (when you delete). Discounts: If you wish to add a new price on an existing product simply type it in the "New Price" box. This will now be the new valid price for the product. At the front end the user will see the normal price in strikethrough format while the new price is shown underneath it. You can also control the color of the discounted price from the design tab. Updating the storefront: Remember to update your storefront with the current changes by clicking on the "Update Product Pricing" box. Once the product pricing has been updated, you can check that all your changes are present to your storefront's product page by clicking on the "View Shop" link, situated on the top right of the Administration Panel page. 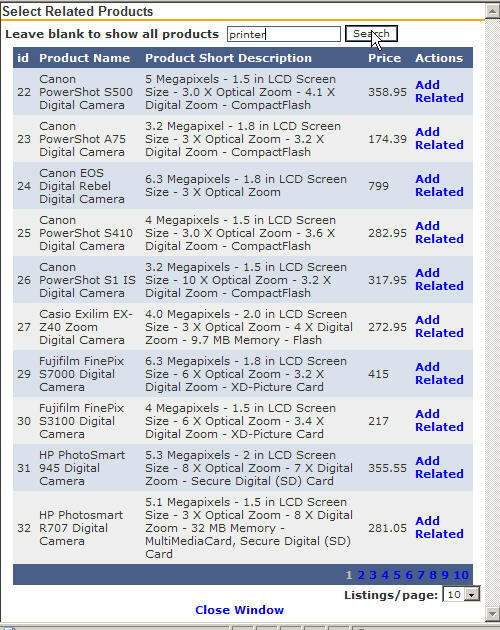 Figure: Page of the Canon PowerShot S500 Digital Camera on the e-store's front end after submitting the previous pricing settings. Promotion is a very important tool for your e-store. You may wish to promote some specific products or add unique title and description tags on every product page of your storefront. The "Promotion" tab is used for setting up a product's promotion features. This tab is accesible when adding a new product using the "Catalog > Add Product" tab, or when editing a product's page (choose "Catalog > Products" and click on a product to edit it). - add unique title and description tags to every single product page of your storefront. On top of the product promotion page you will find four checkboxes. Choose any of them in order to promote your product. Figure: Editing the product's promotion page. Featured on homepage: tick this check box to place the current product as a featured product on your homepage. Featured on category page: tick this box to place the current product as a featured product on the category pages it belongs. Best seller: use this box to tag the product as a best seller. New release: use this box to tag the product as new. Figure: Once you add all related products, place them in the order you prefer by using the "Order" buttons. The pop up window will show all the products available in your e-store catalog. To only view the products of a specific category, type the category name in the text box at the top of the window and press the "Search" button. Once you have found the product you want to select, click the "Add Related" link to add the product to the related products list. When you add a new product on your Magnet Commerce store, the product title tag (the title appearing on the browser when the product page opens) is automatically set to the product's name followed by your store's title. Additionally, the product's short description and name get added as metatags on your store's product page. 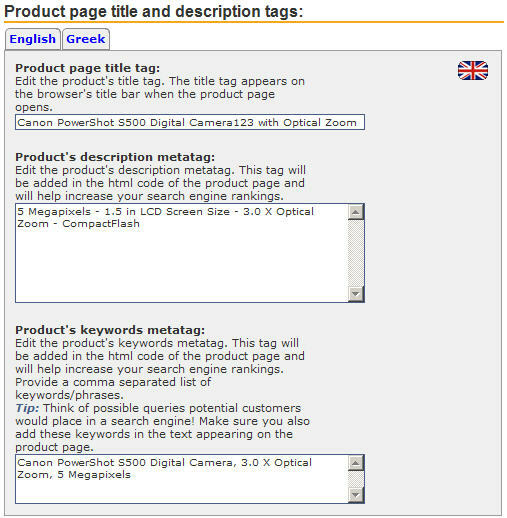 These metatags will provide better information about your product to search engines. Figure: Editing the product's title and description tags. Product page title tag: When adding a product, the product's title tag (the title appearing on the browser when the product page opens) is automatically set to the product's name followed by your store's title (set in the "Setup > General" tab). Use this field to define a new title tag for you product. Product's description metatag: When adding a product, the product's short description (set in "Catalog > Add Product > Presentation" tab) is automatically added in a "description" metatag within the html code of the product page. You can use this field to edit the contents of the "description" metatag. This tag is picked up by search engines, so this is a way to provide search engines with the exact information you want for your product. Product's keywords metatag: When adding a product, the product's name (set in "Catalog > Add Product > Presentation" tab) is automatically added in a "keywords" metatag within the html code of the product page. Use this field to provide a comma separated list of keywords/phrases for the product's "keywords" metatag. Just like the "description" metatag, the "keywords" metatag is picked up by search engines and will help increase your rankings. Think of all possible queries potential customers would place in a search engine when looking for your product! But make sure you also add these keywords in the text appearing on the product page as you might be penalised by search engines otherwise. for multi language stores: These tags are automatically created from the product's name and short description that is initially saved for each language (the first time you click "Update Product Presentation" when adding a new product). If you translate the product's name and short description to a language at a later stage, the content of the tags in this language won't get updated automatically - you will have to translate these as well! For this reason, it is better to provide the correct name and short description for all languages the first time you save a product's presentation features. Updating the storefront: When you have finished setting up your products promotion features, update your storefront with the current changes by clicking on the "Update Product Promotion" button. Figure: Saving the products promotion features. Once you have set up your product's promotion, you can check your storefront to view your changes. Go to your storefront by clicking on the "View Shop" link, situated on the top right of the Administration Panel page. 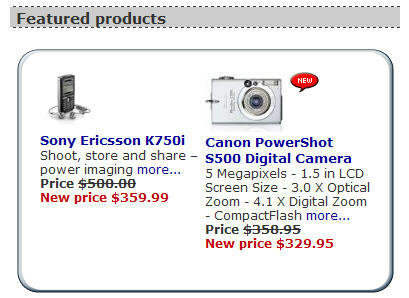 Figure: Featured products appearing on the e-store's homepage. 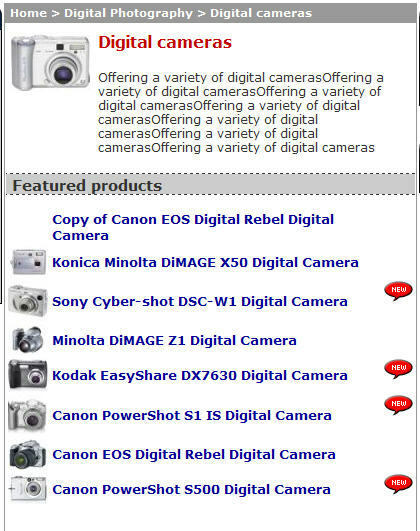 Figure: Featured products appearing on the e-store's "Digital Cameras" category page. 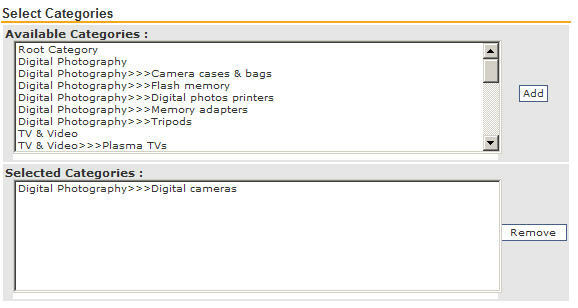 Figure: Related products appearing on the product's storefront page. Figure: Metatags appearing in the product page source code. Magnet Commerce allows you to sell electronic products on your online store. These are downloadable goods such as songs, e-books, images, zip files etc. Once an eProduct has been ordered and the payment has been received, the customer will be given a link from which the eProduct can be downloaded. Figure: Setting up a downloadable product. Click "Browse" to choose the file you want to deliver when the product is purchased. Once an eProduct has been ordered and the order status has changed to "Payment received" (see next section) , an email is automatically sent to the customer, with a link from which the product can be downloaded. Using the drop down menu on this form you can define how long the link will be active for. The timer starts the minute the email is sent to the customer. After the designated time passes the link will no longer work and the customer will not be able to download the product. When you have finished with the form click "Add / Update eProduct" to upload the file. This can take a while depending on the size of the file you are uploading. When the upload has finished, a message will appear informing you that the file has been uploaded. Figure: When the upload has finished, a message will appear informing you that the file has been uploaded. Of course you can upload a different file or change the expiry period at any time; simply change the relative data and click "Add / Update eProduct". Finally, click on "Delete eProduct" to remove the downloadable file. Figure: Setting the status of an order to "Payment received". When you click "Submit" an email will be automatically sent to your customer, with a link through which the product can be downloaded.
! This link will only be active for the period you have defined on the product's eProduct tab (see above section). Add a new product by choosing 'Catalog > Add Product' in the Administration Panel. The 'Add Product' page is split into 3 different sections: Presentation, Pricing and Promotion. Using the Presentation form, the following product information can be added to your storefront: product code, availability, descriptions, categories, filters, attached files, images and redirect links. Using the pricing form you can set the base price, any surcharges as well as discounts for your product. Additionally you can add variants for your product (different sizes, colors etc.) define the stock status and the weight of the product. 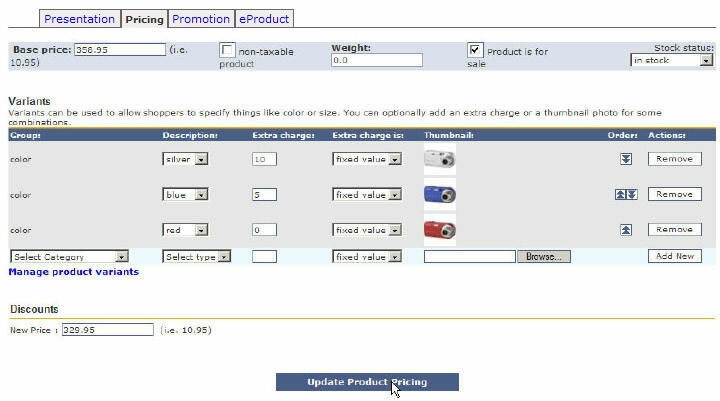 Using the Promotion page when adding a product ('Catalog > Add Product'), you can feature the current product on your e-store's product page and on the category page(s) it belongs to. You can also tag it as "New" or "Best Seller". Finally, you can add related products to the product page, and change the product page title tag and the "description" and "keywords" metatags. Using the eProducts page you can upload files for downloadable products (eProducts). The exact same sections and fields can be edited for an existing product by choosing "Catalog > Products" and clicking on the product's name.